You'll be £19.99 closer to your next £10.00 credit when you purchase The Western Front - Landscape, Tourism and Heritage. What's this? The Western Front has become, once again, and after 100 years, an important and increasingly popular tourist destination. The Centenary is already encouraging large numbers of visitors to engage with this highly poignant landscape of war and to commemorate the sacrifice and loss of a previous generation. Interest is also being sharpened in the ‘places of war’ as battle-sites, trench-systems, bunkers and mine craters gain a clearer identity as war heritage. For the first time this book brings together the three strands of heritage, landscape and tourism to provide a fresh understanding of the multi-layered nature of the Western Front. The book approaches the area as a rich dynamic landscape which can be viewed in a startling variety of ways: historically, materially, culturally, and perceptually. To illustrate these two dominant interpretations of the region’s landscape – commemorative and heritage – are highlighted and their relationship to tourism explored. Tourism is a lens through which these layers can be peeled away, and each understood and interacted with according to the individual’s own knowledge, motivation, and degree of emotional engagement. Tourism is not regarded here as a passive phenomenon, but as an active agent that can determine, dictate and inscribe this evocative landscape. The Western Front: Landscape, Tourism and Heritage is a timely addition to our increasing interest in the First World War and the places where it was fought. It will be indispensable to those who seek a deeper understanding of the conflict from previously undervalued perspectives. Stephen Miles’s The Western Front. Landscape, Tourism and Heritage is a useful way into the growing topic of battlefield visits. Academic, but briskly written, his book outlines the rise of pilgrimages to the Western Front, the revival of interest in these places from the 1960s, and the rise of coach parties and school visits. It also makes very clear just how sought after this trade is by the post-agricultural residents of North East France and Flanders. This is one of many books that have appeared and will appear dealing with the Great War. It is a valuable contribution to that literature, and few will approach the success Miles has achieved in demonstrating the clear, if complex, relationship between the landscape, the heritage and tourism. 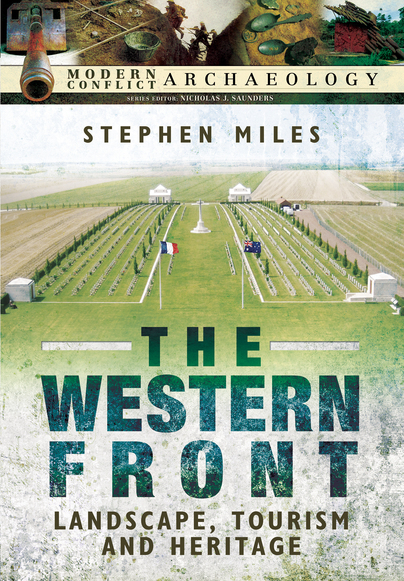 Stephen Miles' Western Front is a carefully crafted oeuvre which makes a fine literature resource for the classroom whenever issues of WWI ( and WWII) are chosen topics for discussion. It is a great book and admirable achievement rightfully included in the Modern Conflict Archaeology Series. For geographers, as for the reviewer, it serves as a model of how the theme of battlefield tourism can be presented. Stephen Miles' book looks at tourism along the Western Front, from just after the war to the present day. He has to contend with the difficult problem people face between wanting to forget the terrible events of war and the need to remember and honour the fallen. Indeed, forgetting and remembering are moveable feats, for as those who lived through those events pass away, forgetting becomes less necessary and remembering becomes a more dominant issue. But remembering becomes more difficult as the ordinary becomes lost and turns into the past, and our remembering becomes historical interpretation. Visits turn into tourism, and landscape and material culture become heritage. From family visits to the great cemeteries, through battlefield guides, to new museums, the Western Front is a different place from 100 years ago, and is obviously experienced in very different ways. Miles' excellent book signposts a way through these complex issues. This is a valuable companion to a visit to the Western Front and an interesting and thought provoking text for students of heritage. A huge amount of research has gone into this book and it does open new perspectives on a war whose interest will surely survive way beyond the Centenary years. It's interesting to see that the title is part of a series planned by publishers Pen & Sword called Modern Conflict Archaeology. I believe anyone with an interest in the Great War and the development of battlefield studies and remembrance would find this a very good read. This is an academic book, but very accessible and stimulating to anyone with an interest in battlefield tourism. There are thought provoking chapters on topics such as the morality of battlefield travel and the etiquette of visiting battlefield sites. An important and thought provoking book. The Western Front: Landscape, Tourism and Heritage therefore makes for a different and fascinating read. Click here to read the rest of the review on The Western Front Association website. This is a unique book ideally produced during the Centenary of The Great War. The text reads more like an academic piece with excellent appendices, illustrations and bibliography. However, it is very accessible and by looking specifically at Landscape, Tourism and Heritage the book makes a very interesting companion to anyone interested in WWI. I particularly liked the writing about remembrance and the not always heard statistics over the number of missing; resting within, under and now part of the landscape of The Western Front. Due to its proximity to the British Isles it is not surprising that so many in the aftermath of the end of hostilities went to see where their loved ones were lost and buried. It is also interesting to learn that what was once contemporary history is now taught as part of the national curriculum and many educational trips are made to the former battlefields, the cemeteries and museums. It is acknowledged that many of the combatants rarely talked of their experiences; were restricted what they could write in their letters home and didn't have access to or permission for photography. Over time these veterans have returned and found closure or comradeship with their brothers in arms. They have now all died and it is fascinating that much of the remembrances are now undertaken by 2nd and 3rd generation descendants aware of family history and making personal pilgrimages to Belgium and France. As the Centenary, has approached many celebrations and acts of remembrance. New museums and tourist sites have arisen in the past 20 years as more and more people have journeyed here to see the landscape for themselves. This has been fuelled by popular literature, personal interest in genealogy and a unique place where a battle raged within entrenched positions for over 4 years. Some interesting comments regarding how we respect these sites, now take selfies and want more interactive presentations. There are questions as to whether these trends will continue or if there will be a fall in tourism into the next decade and beyond. I am prompted to plan a visit and make the place personal to me. Useful for pre-tour research, the author has put a significant amount of work in to collating the information within. I found this an interesting read, and I do wonder how the Western Front will be viewed and or visited in another 100 years time. It is a useful reminder about how different people can all have different points of view. Immediately after the war, people wanted to get their lives, farms and villages back to normal so many reminders of the war were removed. Now there is a desire among many to want to understand/see how it was. In the book and among the appendices there are some very useful tips and advice for anyone wanting to visit the area today. Stephen Miles is an Affiliate Research Fellow at the University of Glasgow’s Crichton Campus in Dumfries. He studied at the universities of Durham and Sheffield before undertaking a PhD at the University of Glasgow which he completed in 2012. He has previously written on ‘dark’ tourism and sense of place at conflict sites.